Comment: Licorice, malt, heather, ginger and coal dust rule this dram. One can also find vanilla cream, oak, toffee, leafs, honey, pistachio, spinach, spices (white pepper and chili) and fruit (mainly apples but also peach and pineapple) in the nose of this Speysider. It tastes and finishes rather dry on hay, licorice, white pepper, oak and apricot fruit, quite similar to its nose. 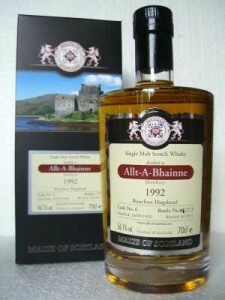 Water helps a lot by making this Allt-a-Bhainne creamy and less dry with a better balance. Decent, I must say. Not only one to complete your ‚drinking map‘ of Scotland.